So I've been eating out a fair bit recently. My first was trip to Golden Union for fish and chips, I had Rock Fish and Chips but actually I didn't much like it. The fish was mushy and the chips were not lovely and soft in the middle. I then went to a Cheese Festival with some friends in Camden. 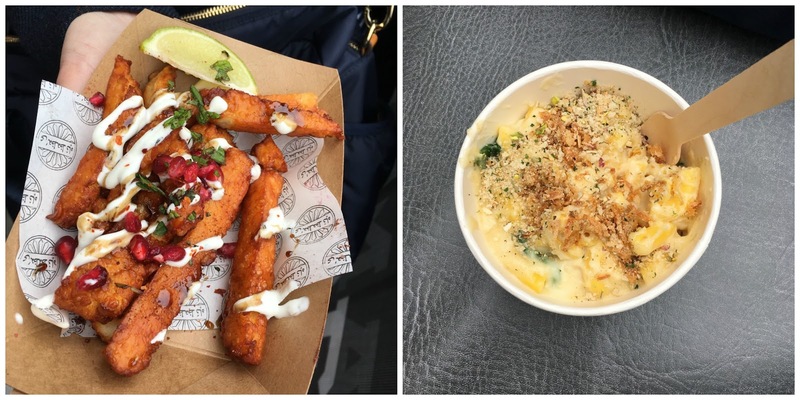 I had some Halloumi Fries from Oli Baba's and then Spinach Mac and Cheese from Mac to the Future. Both were absolutely delicious. I had a huge craving for Mac and Cheese and this definitely hit the spot. I then went to Kati Roll Company, I had an Unda Aloo Roll, which was very good. Although they managed to give my vegetarian friend a chicken roll rather than a veggie one and they weren't exactly apologetic about it. After that we went to Bubblewrap. I had Vanilla Ice Cream, Strawberries, Oreo Pieces and Salted Caramel Sauce. This was seriously one of the best things I've eaten in a long time! Yum! Then I met a friend at Dirty Bones. We both had The Mac Daddy - burger, pulled short rib, mac and cheese, burnt onions and barbecue sauce with Skinny Fries. It was so so so good. I can't remember what the cocktail was but that was yummy too. I also had a Peanut Butter Cookie Cup for afters and that was really good. Then I went to Made in Italy. 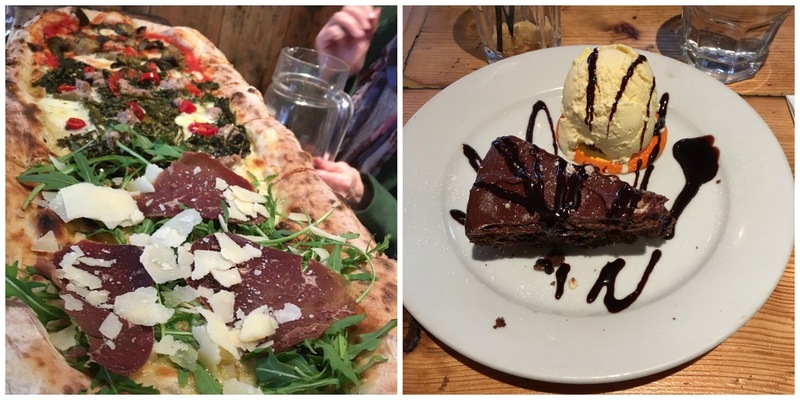 Three of us ordered pizza and it came as one giant long pizza. It was very cool! My section had Mozzarella, Wild Broccoli, Fennel Sausage and Chilli. Followed by Ferrero Roche Cake. The pizza was scrummy and the cake was ok. 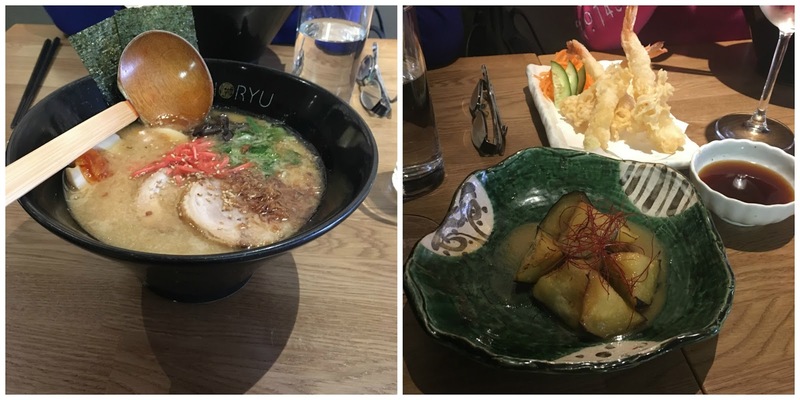 I met my Mum and Sister at Shoryu. 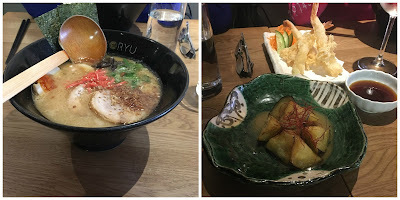 I had the Kotteri Hakata Tonkotsu Ramen and then we had Tempura Prawns and Fried and Grilled Aubergine. The broth was very meaty and tasty. Not as good as Bone Daddies but pretty good. Just before I went on holiday I had a takeaway from Brioche Burger. I had the Oh My Cod Burger and Monkey Fries, both were yummy and I will definitely try them again. More eating! I've been up to quite a bit of eating recently. I had two weeks off work for the Easter holidays and I tried some of the places on my list! The first was Broadway Market, which I've been meaning to go to for ages. I really went to pick up a shoulder of lamb for Easter Sunday but I couldn't help but by a few other things! The first was a Shrimpster Burger from The Shrimpy stall. It was grilled shrimp, pickled cucumber and samphire and boy was it good. I also got a veggie scotch egg from Scotch n Tails, which was interesting. I had a S'mores Brownie from Eat 'n' Mess, it was incredible. They also do a peanut butter cookie sandwich which I am definitely going to try next time I go back! I then took a trip to Rinkoff's Bakery and got an Apple and Caramel Crodough and a Creme Egg Brownie, I had to get something Eastery! I was a bit disappointed by the Crodough but the Creme Egg Brownie was so so good. It is in a bit of funny place in the middle of a council estate but definitely worth a visit! I also took a visit to Whitecross Street Market. I went for a Pork Banh Mi from the Banh Mi stall on the market, it was so good and really similar to those I ate in Vietnam. My sister had a halloumi gozleme wrap and I have been dreaming about that ever since so next time I'm going to have that! I took a trip to Paris for a day to see an exhibition at the Louvre and we stopped at Cafe de Paris for lunch. I went for the stereotypical and I don't care! I had a Croque St Honore, which is Croque Madame but with Tomato and it was good. 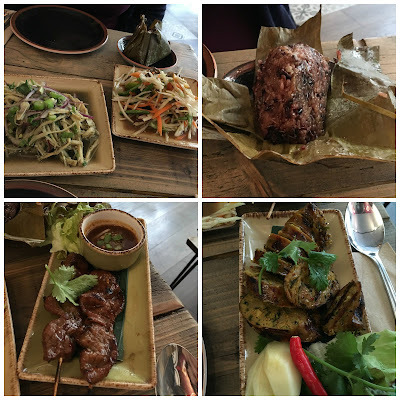 I took my Mum to Lao Cafe for dinner one evening, we had a couple of salads, Tum Lao which was a papaya salad, Soop Nor Mai a bamboo shoot salad, chargrilled pork skewers, herbal northern sausage and brown sticky rice. All were really lovely and you can choose how spicy you want to salads. The Sausage however was way too hot for both of us! On the way home we stopped at Bridget's Bakery. I couldn't tell you what they were but they were delicious! We also went back to the German Gymnasium, this time I had the Puszta Pan; courgette, tomato, paprika, goat's cheese and egg. It was so so good. Now I just have to go back and try the German Power Breakfast! We also went on a Beekeeping Course at the Geffrye Museum run by Barnes and Webb. The course was really good, we even got to dress up in the full suit, and we got a slice of honey cake to keep us going! Next is a Dig-It Mushroom burger from Patty & Bun with the Chips with Chicken Skin Mayo and Chicken Salt. Again yummy! We also tried a Pink Mojito and that was delicious too. Now to this weekend. On Saturday I met a friend and we went to Ghetto Grillz. I had an LA Chick Bagel - chicken thighs with a green herb and lime zest pesto, rocket and aioli, my friend had a Veggie Reuben. We also shared a portion of Sweet Potato Fried Avo Royale - sweet potato fries with avocado, sriracha and garlic mayo, heaven! The whole thing was complete heaven! For pudding we went to Cookies and Scream a vegan bakery. 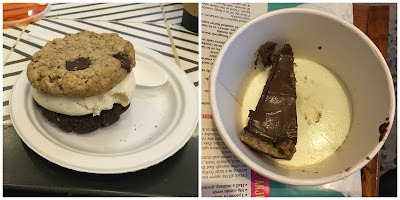 I had a cookies ice cream sandwich, i went with oatmeal and raisin and double chocolate chip cookies. I also ordered a piece of Beelzebub pie which I took home, this was AMAZING! 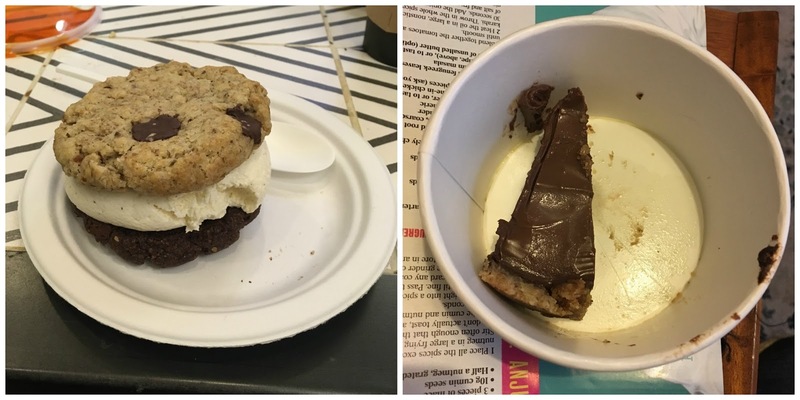 Normally I shy away from vegan food, and yes the ice cream wasn't as creamy as normal ice cream but the rest was fantastic! 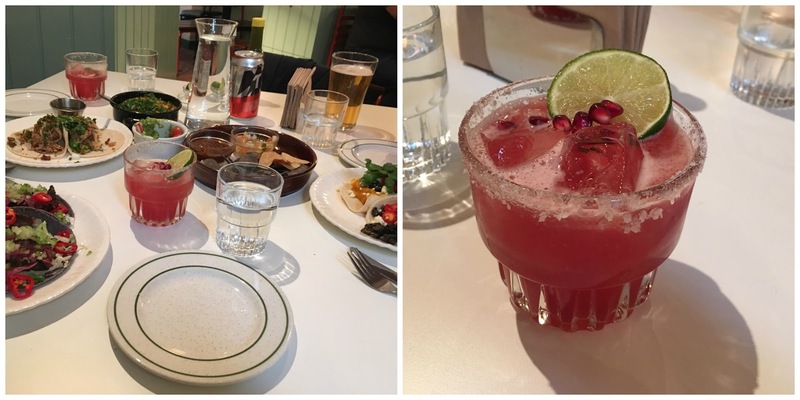 On Bank Holiday Monday I went for tacos at the Corazon Taqueria with a couple of friends. We had Totopos with Guacamole and Salsa, Carne Asada Tacos, Carnitas Tacos, Butternut Squash and Mushroom Tacos and we also got some rice and bean thrown in! 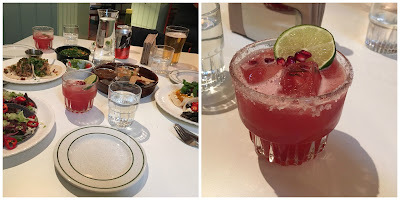 I also had a Pomegranate and Hibiscus Margarita. All of it was delicious, really yummy. I came back via Crumbs and Doilies and had a piece of Jammie Dodger cake, really really good. I also tried a White Chocolate and Black Sesame Mini Cupcake, Yum! I made this cake as a prize for the class at school who returned all their library books first! Bribery works!! It was so delicious and the kids all loved it. Preheat the oven to 200C and grease a 22cm springform cake tin. Beat the butter and sugar in a large bowl until pale and fluffy, then mix in the egg, egg yolk and vanilla. Combine the flour, cornflour and baking powder, then fold into the butter mixture until fully incorporated – it will be quite thick. Add the chocolate chips and mix until evenly distributed. Spoon the mixture into the prepared tin and bake for 20-25 mins or until light golden brown. Leave to cool for 5 mins. Whilst the cake is cooling make the chocolate frosting. Beat the butter with a hand held mixer on a medium speed until creamy - about 2 mins. 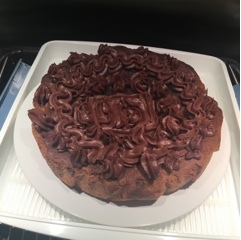 Sift the icing sugar and cocoa powder into the bowl alternating with the cream and vanilla. Beat on a low speed after each addition. Once it is all added, beat on high speed until creamy and combined for at least 2 mins. Add a pinch of salt if the frosting is too sweet. Decorate the cooled cookie cake with frosting. Cut into slices and serve. This is a delicious risotto. Heat a little oil in a saucepan over a medium heat and cook the bacon until golden and crispy, then remove to a plate. Add the onions and fennel to pan with a little more oil and a splash of water. Cook for 10 mins, stirring regularly or until softened. Meanwhile, simmer the stock on a low heat with the garlic clove and the chilli. Prick each tomato with the tip of a sharp knife and put into the stock, adding the vines if you have them for flavour. After 1 min scoop out the tomatoes and carefully remove the skins. Stir the rice into the veg and leave to cook for 2 mins, then gradually adding the stock a ladleful at a time, stirring and waiting for the stock to be absorbed before adding the next. Repeat this stirring for 20 mins or until the rice is cooked. Stir in the prawns and tomatoes for the last 5 mins. Meanwhile put the parsley, lemon zest, chilli halves and garlic from the sock pan, and the bacon onto a board and finely chop to make a sprinkle. 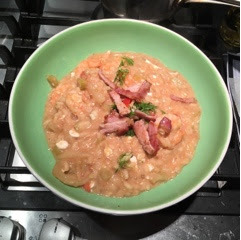 Stir the cottage cheese into the risotto, season and then serve with the sprinkle scattered over. 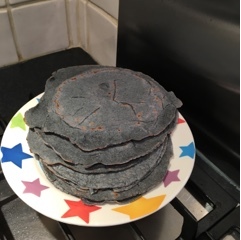 So these tortillas are blue mostly because when I went to the Cool Chile Company Stall, that was all they had left! I made them to use up some of the leftover lamb I had, making enchiladas stuffed with beans, sweetcorn, courgette and of course lamb. These are really easy to make. Mix the masa harina and salt in a bowl. Add the water a bit at a time and olive oil and mix until a smooth dough is formed. Set aside covered for 20 mins. Divide the dough into 8-10 balls. Flatten the balls of dough with your hands or use a tortilla press or roll them between two layers of cling film/greaseproof paper. Flatten to approximately 3mm thick. To cook the tortillas, lightly oil a flat griddle pan or frying pan and place over a hot heat. Cook the tortillas for approximately one minute on each side, or until lightly coloured. 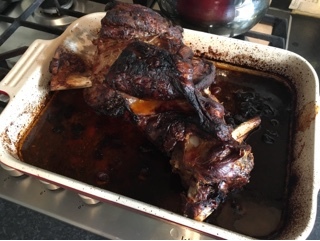 So, as is traditional for Easter Sunday I made myself roast lamb. A whole 2kg shoulder of lamb, just for me! Of course I didn't eat all of it in one go but I had a pretty good portion of this last Sunday, It's meant to be served with couscous and salad. 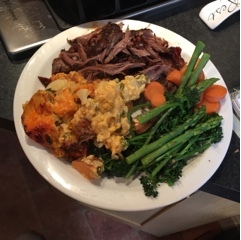 I went for Red Leicester Potato Gratin and Veg. Yum! Preheat oven to 170C. Put the lamb, garlic, ras el hanout, oregano, tomato, stock, molasses, salt and pepper in a baking dish. Cover with foil and bake for 3 hours, turning the lamb halfway through. Uncover and cook, meaty side up, for a further 30 mins. Remove the bone and transfer the lamb to a serving dish. Spoon over the pan juices and drizzle with molasses. Serve. I served this is a wrap with some lettuce, it would be lovely with some cooked beetroot too. Break the trout into small pieces, removing any bones and put them into a bowl. Add the cucumber, dill, creme fraiche and horseradish and stir to combine. Season with salt and pepper and squeeze of lemon juice. This is a very tasty dinner dish. I loved the crunch of the kale with the soft rice and salmon. In a shallow bowl, whisk together all the marinade ingredients until well combined, then lay in the fish fillets, turn to coat all over, and refrigerate for at least 30 mins. Put the rice into a pan with 600ml water and the rice vinegar, season with sea salt and a pinch of sugar, cover and bring to a boil. Immediately turn down the heat to its lowest setting and leave the rice to steam for 15 mins. Turn off the heat, and keep somewhere warm, still covered. While the rice is cooking, remove the kale stems and finely shred the leaves. Spread the kale out on one or two baking sheets and spray with cooking spray to coat. Sprinkle on the sugar and a pinch of salt, and bake for seven to eight mins, until dark green and crisp, stirring halfway through, so they cook evenly. 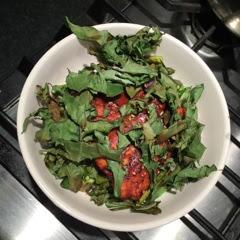 Watch the kale like a hawk towards the end, so it doesn’t catch and burn. Put the salmon on an oven tray and roast for 12-15 mins, basting with more marinade halfway through. 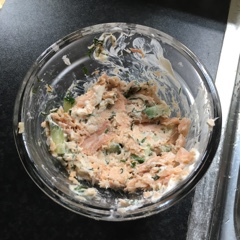 Divide the rice between four bowls, then top each serving with a fillet of salmon, any leftover marinade juices from the tray and the kale. Serve with soy sauce, more vinegar and some chilli oil. 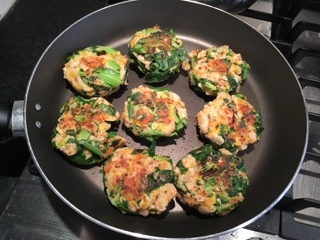 This recipe came with my veg bag a couple of weeks ago and they are delicious. I used red leicester for the cheese and that worked fantastically. I served them over salad with a tomato and aubergine salad over the top but they would be yummy with a poached egg or as a burger in a bun. Blanch the greens in a pan of boiling water until tender, 2-3 mins. Drain and run under the cold tap. Leave to drip dry. Mash the cannellini beans with a fork. Squeeze the greens to get rid of the excess moisture, then roughly chop and add to the beans along with the spring onions, cheese, breadcrumbs, mustard and egg. Taste and season. Shape the mixture into 8 evenly sized cakes and chill for 15 mins. Heat a splash of oil in a large frying pan and fry for 5-6 mins on each side until golden brown and heated through. Serve. 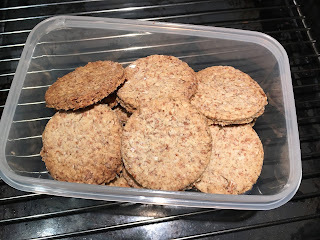 I've had a hankering for oat cakes for a while and what better way to get them than to make them myself! These are super east to make and feel lovely and wholesome. Mix together the oats, flour, salt, sugar and bicarbonate of soda. Add the butter and rub together until everything is mixed and has the consistency of large bread crumbs. Add the water (from a recently boiled kettle) bit by bit and combine until you have a somewhat thick dough. The amount of water varies; depending on the oats. Sprinkle some extra flour and oats on a work surface and roll out the dough to a 1/2 cm thickness. Use a cookie cutter to cut out shapes. 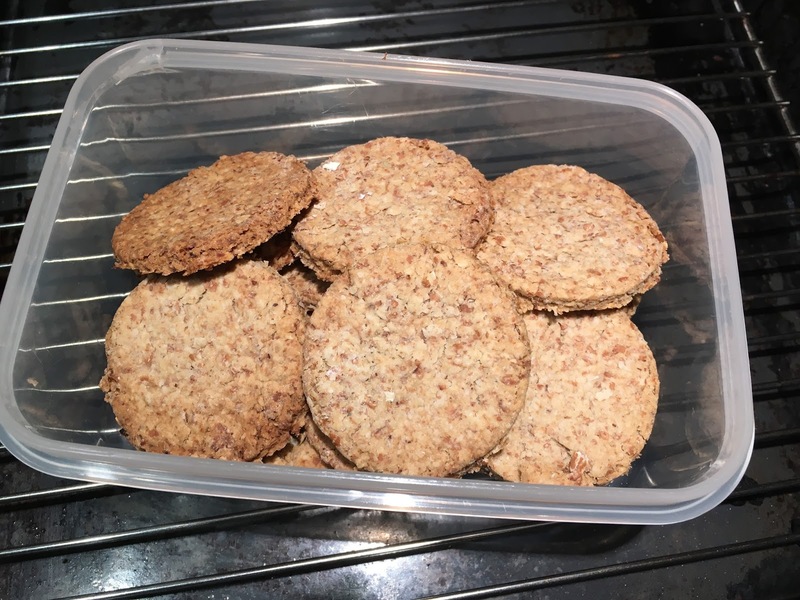 Place the oat cakes on a baking tray and bake for 20-30mins. or until slightly golden brown.